When best friends are not forever . . . Shannon and Adrienne have been best friends ever since they were little. But one day, Adrienne starts hanging out with Jen, the most popular girl in class and the leader of a circle of friends called The Group. Everyone in The Group wants to be Jen's #1, and some girls would do anything to stay on top . . . even if it means bullying others.Now every day is like a roller coaster for Shannon. Will she and Adrienne stay friends? Can she stand up for herself? And is she in The Group—or out?Newbery Honor author Shannon Hale and New York Times bestselling illustrator LeUyen Pham join forces in this graphic memoir about how hard it is to find your real friends—and why it's worth the journey. The autobiography assignment. I don’t pretend to know precisely why teachers give it out or what they hope child readers will get out of it. About ten years ago, when I was a children’s librarian in New York City, it was to be feared. A small child would walk into my room, belly up to the reader’s advisory desk, and ask for an autobiography. You mean a biography? No (of course not, silly librarian). An AUTObiography, see? And there, clear as crystal, was the printed assignment. So like any good The autobiography assignment. I don’t pretend to know precisely why teachers give it out or what they hope child readers will get out of it. About ten years ago, when I was a children’s librarian in New York City, it was to be feared. A small child would walk into my room, belly up to the reader’s advisory desk, and ask for an autobiography. You mean a biography? No (of course not, silly librarian). An AUTObiography, see? And there, clear as crystal, was the printed assignment. So like any good librarian I’d take the child to the biography/autobiography section and we’d start to hunt and peck. As it happens, middle grade authors of books for kids really like writing autobiographies. So depending on the age of the child I’d load them down with Knots in My Yo-Yo String by Jerry Spinelli or Marshfield Dreams by Ralph Fletcher or maybe one of the Beverly Cleary ones like A Girl From Yamhill. Not like there was a lot to pick and choose from. Then, like magic, something changed overnight. Authors started writing more autobiographies and, glory be, they were done in a graphic novel format!!! Smile and Sisters by Raina Telgemeier, Sunny Side Up by Jenni Holm, El Deafo by Cece Ball, and The Dumbest Idea Ever by Jimmy Gownley. Sure, there aren’t a ton of these books out there, but they sure pep up the autobiography assignment, I can assure you of that. Now Shannon Hale joins the illustrious crew with a book that zeroes in a single topic: friendship. The good. The bad. The seriously-why-is-this-so-freaking-DIFFICULT! ?When you’re really little, making friends is easy. You sit next to someone in Kindergarten and suddenly they’re your best friend for all time. For Shannon, Adrienne was that friend. Yet when third grade rolled around, things started to change. Suddenly Shannon, Adrienne, a popular girl named Jen, and a whole bunch of other girls are in The Group. That includes Jenny, Jen’s best friend and a dyed-in-the-wool bully to Shannon. Figuring out if she’s out or in can be exhausting for Shannon, and that’s before you even consider her violently unpredictable older sister Wendy or her own OCD. But that’s the thing about true friends sometimes. They sure as heck don’t come easy.In her Author’s Note at the end Shannon says that “Real Friends it he story I’ve been telling myself about my elementary school years,” yet also acknowledges that “memories aren’t 100 percent accurate.” She mentions that the idea of writing a memoir was a relatively recent one considering the fact that from a drama perspective she had a pretty stable home life. That, naturally, is the allure. With Real Friends Hale zeroes in on a single aspect of childhood: friendship. It’s something a lot of kids have to contend with. In her own Author’s Note, artist LeUyen Pham says her heart, “is still convinced that somehow you [Shannon] crawled inside my memories and handpicked all these events and feelings and insecurities from my childhood and called them your own.” I think that’s the true allure of the title. This is a mirror for a lot of kids who are struggling with friendships. They’re going to see what LeUyen saw and feel it too. There was a movement not too long ago where people on YouTube let teens know that “it gets better”. Shannon’s message is the same. As she puts it, “If you haven’t found your ‘group’ yet, hang in there. Your world will keep growing larger and wider. You deserve to have real friends, the kind who treat you well and get how amazing you are.”But how do you do it? How do you take faulty memories and etched-in-stone feelings from the past and turn them into a book? On a recent episode of the podcast RadioLab, a lot of discussion was made of the fact that to even access memories, a person needs a lot of imagination. The same could be said of conjuring up memories for a graphic novel. Hindsight may be 20/20 but memory is 3/10. Sometimes it’s necessary to plug the details up with creativity. In a way, Shannon probably had a lot of this book mapped out in her head already. Dwell on something enough and you turn it into a story, complete with dramatic shifts in tension and morality. I particularly appreciated the moments when Shannon, the character, was in the wrong. This book doesn’t usually break down into “good” and “bad” people, but rather into the casual indifferent cruelties of childhood. The off-handed comment you don’t even remember saying that burned a small hole into your friend’s soul. The fact that Shannon’s just as capable of this as anyone gives the book a bit of extra weight.There’s one other aspect of the book that sets it apart from the pack. Heck, sets it apart from pretty much every children’s graphic novel from a trade publisher I’ve ever seen: religion. Shannon grew up in a Mormon household and so religion is just a regular event in her life. We see prayer, Sunday scriptures, and the occasional Jesus cameo when Shannon is feeling particularly down in the dumps. The only other middle grade graphic novel (comics for 9-12 year olds) I’ve ever seen from a large publisher that incorporates worship as seamlessly would be the books in the Hereville series by Barry Deutsch, and that was Hasidic. Someone once commented that the only sitcom you see on your television these days where a family regularly goes to church is The Simpsons. In children’s books that topic is almost entirely regulated to small religious presses. So I appreciate that Real Friends doesn’t shy away from something that, for a lot of people, is a regular part of life.And now, a word in praise of LeUyen Pham. Pham and Hale are hardly strangers to one another. For years now they’ve collaborated together on the delightful Zorro-esque Princess in Black series. That said, I haven’t seen Ms. Pham do a graphic novel since she worked on the far older Prince of Persia back in 2008. They take a bit of time to do, after all. What’s more, all the autobiographical graphic novels I mentioned at the beginning of this review were written and illustrated by the same person (always excepting Sunny Side Up which is a brother/sister team). If you bring in an artist to basically illustrate your life, you want someone you can trust. Good thing Ms. Pham is a stickler with accuracy. When she illustrated the nonfiction biography about Paul Erdos The Boy Who Loved Math she went so far as to clarify in her Illustrator's Note at the end that she had to imagine the physical appearance of the boy’s nanny. Real Friends isn’t nonfiction in the strict sense of the word. Characters are combined, timelines are moved up, and names are definitely changed. Still, just looking at the setting you really feel you’re in the 1980s. Pham’s attention to detail is given full reign, whether you’re checking out the computers, the clothes (oh the clothes, the clothes, the clothes) or even the furniture. Not that it’s all coke bottle glasses and Thompson Twins. There’s enough pretend and imagination in these storylines to allow Pham to really stretch her muscles and engage in spy sequences, fantastical journeys, and even the occasional Dallas Cowboy Cheerleader.In many ways the book Real Friends feels the closest to in terms of content and tone is El Deafo by Cece Bell. Both books are quests for true friendship. Both take place in the past (though Bell’s is probably set eight or so years before Hale’s). And both are autobiographical memoirs that look at bad friendships, hurt feelings, and the ultimate reward that all kids can relate to: a good friend. A fun strong book to show kids that even when you haven’t got a real friend in the world, there’s a light at the end of the tunnel. For ages 9-12. Perfect for a 10-year-old, Real Friends looks at the complex relationships among elementary school girls. It teaches readers that good friends don't treat you badly.It also delves into the thorny issues of sibling abuse and rivalry, bullying and crushes.I liked Real Friends not only for its story, but also for the way that it allowed me to connect with my child. We read the book together and shared our thoughts on friendships.The author, Shannon Hale, based this book on her real life experiences Perfect for a 10-year-old, Real Friends looks at the complex relationships among elementary school girls. It teaches readers that good friends don't treat you badly.It also delves into the thorny issues of sibling abuse and rivalry, bullying and crushes.I liked Real Friends not only for its story, but also for the way that it allowed me to connect with my child. We read the book together and shared our thoughts on friendships.The author, Shannon Hale, based this book on her real life experiences. She includes snapshots from her own childhood on the last couple of pages.It is a great graphic novel for young readers. Highly recommended. I've had my eye on this graphic novel memoir set in the 80s for awhile now, so I was beyond keen on getting my reading on. I sped through this thrilling ride in one big whirlwind. When best friends are not forever . . . Shannon and Adrienne have been best friends ever since they were little. But one day, Adrienne starts hanging out with Jen, the most popular girl in class and the leader of a circle of friends called The Group. Everyone in The Group wants to be Jen's #1, and some girls would do I've had my eye on this graphic novel memoir set in the 80s for awhile now, so I was beyond keen on getting my reading on. I sped through this thrilling ride in one big whirlwind. When best friends are not forever . . . Shannon and Adrienne have been best friends ever since they were little. But one day, Adrienne starts hanging out with Jen, the most popular girl in class and the leader of a circle of friends called The Group. Everyone in The Group wants to be Jen's #1, and some girls would do anything to stay on top . . . even if it means bullying others.Now every day is like a roller coaster for Shannon. Will she and Adrienne stay friends? Can she stand up for herself? And is she in The Group―or out?This book, to be honest, made me feel utterly frightened for my nine-year-old sister. Like, what kind of fresh hell is going on in the American education system where the amount of bullying Shannon went through in the fourth grade was completely overlooked to the point of oblivion.This is frightening... The amount of pain and suffering school can bring to a child made me that feel sure about my decision to homeschool.I was then also gobsmacked by the abuse Shannon experienced at the hands of her older sister, looking to alleviate her own pain by putting it all on this little girl. I mean, if it's unacceptable to hit a nine-year-old stranger, then it sure as hell is unacceptable to hit your own sister.I'm still shellshocked at this panel. This poor kid experienced utter terror in her own home. Shannon ran to hide just at the sound of Wendy's voice and that had me nearly in tears.Please, treat your younger siblings with all the love and respect you have.Shannon's perspective gave us a very keen look on her girlhood, and it made me understand certain outbursts kids might have with a more clear eye. Like, when she was "playing" with her siblings and starts crying when caught, not at her loss but at the overwhelming build-up of emotions from feeling left out. It made me remember that kids tearing up isn't usually about the situation at hand but about something much deeper in their heads that only they have the knowledge about. And it's our jobs to show them that they can trust us enough to share their thoughts. On a more uplifting note, Real Friends has some incredible art that I'd like to highlight by sharing a few favorite panels of mine:Note: I’m an Amazon Affiliate. If you’re interested in buying Real Friends , just click on the image below to go through my link. I’ll make a small commission! Support creators you love. Buy a Coffee for nat (bookspoils) with Ko-fi.com/bookspoils This review and more can be found on my blog. "Friendship in younger years can be especially hard because our worlds are small. If you haven't found your 'group' yet, hang in there. Your world will keep growing larger and wider. You deserve to have real friends, the kind who treat you well and get how amazing you are. "I didn't realize this was a memoir about Hale's elementary school years! That made it all the more awesome. I hate cliques, so I could relate to Shannon's loneliness when her best friend joins "the group." I sometimes wish I c "Friendship in younger years can be especially hard because our worlds are small. If you haven't found your 'group' yet, hang in there. Your world will keep growing larger and wider. You deserve to have real friends, the kind who treat you well and get how amazing you are. "I didn't realize this was a memoir about Hale's elementary school years! That made it all the more awesome. I hate cliques, so I could relate to Shannon's loneliness when her best friend joins "the group." I sometimes wish I could go back in time to grade school as the person I am now, and just not care so much about what people thought. But like Hale quoted above, that's just the way we understand things when we are young. Sometimes we have to remind ourselves as adults that we deserve friends that will treat us kindly. Highly recommend to everyone! Accurate to the point of heartbreaking, this is a very honest look at the complexities of friendship and family dynamics. Some of this felt like it was copied from my Cabbage Kid Diary, some of it made me grateful that it never happened to me. Such an important read for kids and parents! This is a good one to have the whole family read and discuss, not forgetting the author's note at the back. And of course the art is just amazing, love LeUyen's work. Just stunning. 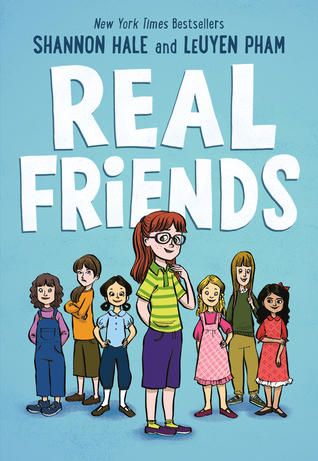 Following little Shannon's life from kindergarten through fifth grade, Real Friends captures the emotional roller coaster ride of friendship, from navigating the tricky waters of cliques and bullies to her never-ending struggle to stay in "The Group." Shannon’s honest and heartfelt story reminds us of how hard it was to learn what real friends are—and why finding them is worth the journey. i really liked the plot & illustrations in this book. i think it moved at a nice pace and it was a fun, easy read. Although I do have to admit that I probably would have enjoyed Shannon Hale's autobiographical middle grade Real Friends considerably more in a non graphic novel format (mostly because I do think that LeUyen Pham's accompanying artwork, whilst bright and descriptive, were and are just a bit too cartoony for my own aesthetic tastes and perhaps also my present mood), I have indeed found Real Friends both engaging and evocative (and also very much and in a painful manner reminiscent of my own child Although I do have to admit that I probably would have enjoyed Shannon Hale's autobiographical middle grade Real Friends considerably more in a non graphic novel format (mostly because I do think that LeUyen Pham's accompanying artwork, whilst bright and descriptive, were and are just a bit too cartoony for my own aesthetic tastes and perhaps also my present mood), I have indeed found Real Friends both engaging and evocative (and also very much and in a painful manner reminiscent of my own childhood and how difficult and fraught with emotional turmoil making and keeping friends could be, and that school with its cliques often was anything but enjoyable, often at best somewhat problematic, with bullying especially being a constant spectre). And while therefore I actually have found much of Real Friends more than a bit too close for comfort and thus a reading experience that I have personally found not all that pleasant in and of itself, I still very much appreciate Shannon Hale's candour and that she has basically opened up her soul and her memories to write a personal account of her childhood and the issues she had to face both at school and at home (something that likely must have been difficult, but might also have felt liberating). Now I do have to admit that part of me does rather chafe at the fact that in Real Friends, when it is obvious that Shannon is being both verbally and sometimes even physically tormented by her older sister Wendy, her mother basically seems to just walk away and tell Shannon that she is on her own so to speak. For while by the end of Real Friends (and after also having perused the included author's note), I do have much more of an understanding of Wendy and why she behaves and acts in the manner she does and has been, and even if I do appreciate the ending of Real Friends in so far that Wendy and Shannon seem to finally be willing and able to call somewhat of a truce and have a bit more acceptance and understanding of and for one another, I still do believe that considering how much of Wendy's anger and her outbursts at Shannon often were physically violent, that really, and for both Wendy's and Shannon's sake, the mother should have been much more proactive (but then again, I also very much consider Shannon Hale's honesty both refreshing and necessary, and that telling even younger readers the truth about bullying, about abuse, about family dysfunction and the like is most certainly much much better than pretending it away, making light of, not mentioning it). Why is it so much easier to have virtual friends than real friends? Couldn't we just walk up to someone, and say, "You wanna be my pal? "Shannon Hale takes a look at the difficult prospect of making and keeping friends in this terrific graphic novel. We follow the author through her sometimes lonely years at elementary school when her best (and only) friend joins a clique comprised of popular girls. Shannon gets to hover around the periphery of the group, but never really "belongs" to the gang. T Why is it so much easier to have virtual friends than real friends? Couldn't we just walk up to someone, and say, "You wanna be my pal? "Shannon Hale takes a look at the difficult prospect of making and keeping friends in this terrific graphic novel. We follow the author through her sometimes lonely years at elementary school when her best (and only) friend joins a clique comprised of popular girls. Shannon gets to hover around the periphery of the group, but never really "belongs" to the gang. This one brought back memories from my own childhood - the constantly shifting loyalties, hurt feelings, and jealousy over old friends' new relationships. You meet someone you have a lot in common with; you should be lifelong friends, right? It seems like it should be so easy, but it's not. I'm glad our library ordered a copy of this book. I'm planning on pressing it into the hands of many of the little girls I encounter. This was such a cute graphic memoir about friendship, the social structure as you grow up, and the anxiety navigating it can cause children. It also touches on sibling relationships, how adults interact and listen to children and mental health issues in younger kids and teenagers. Overall, it was a very sweet graphic novel that I think would be an important and useful book for a lot of elementary aged kids. The cover on my arc edition is so much nicer! Oh my god, this was awesome. Real Friends is a brief yet heartfelt tale of being the outcast in a middle school. This book stands out from other books about the same topic because of its emotional heart. Never does this story feel fake or fictional; it's effortlessly real. That's for a reason, given that this book is based off the author's own experiences. It was very easy to empathize with the main character. I loved the emphasis on being real with The cover on my arc edition is so much nicer! Oh my god, this was awesome. Real Friends is a brief yet heartfelt tale of being the outcast in a middle school. This book stands out from other books about the same topic because of its emotional heart. Never does this story feel fake or fictional; it's effortlessly real. That's for a reason, given that this book is based off the author's own experiences. It was very easy to empathize with the main character. I loved the emphasis on being real with your friends, on the ability to laugh at anything. There's such a true, healthy portrayal of friendship here. It's such a great message for middle-grade readers. The art style is clean and pretty, with good shading. I could tell everyone apart with ease. VERDICT: A fantastic middle-grade graphic novel. Definitely recommended towards any children, but it's honestly so short adults could read it and love it too. This is a very sweet graphic novel about friendship. I really enjoyed it. It was just the kind of book I needed to read right now. Like many, my tween years were rough. Actually, that’s a vast understatement. I spent most of sixth grade hiding in my bedroom, trying to will myself into the narrow constraints my school’s resident Mean Girls set for us. Were GAP jeans cool this week? Or was it The Limited? Is 90210 still a thing? And if so, am I supposed to hate Brenda or Kelly? Is Brandon or Dylan the cute one? All I wanted to do was ride my bike and play with Barbies. Not read YM magazine and debate the finer points of lip Like many, my tween years were rough. Actually, that’s a vast understatement. I spent most of sixth grade hiding in my bedroom, trying to will myself into the narrow constraints my school’s resident Mean Girls set for us. Were GAP jeans cool this week? Or was it The Limited? Is 90210 still a thing? And if so, am I supposed to hate Brenda or Kelly? Is Brandon or Dylan the cute one? All I wanted to do was ride my bike and play with Barbies. Not read YM magazine and debate the finer points of lipgloss application. When I turned to books for either advice or solace, as any reader does, no narrative ever fully captured the social complexities, hurt, and confusion I was experiencing. Most did the one thing I swear I’d never do as an adult: develop an unusual case of amnesia that causes one to forget how truly earth-shattering and soul-crushing friendship problems are when you’re a kid. That combined with the 30-minute, Full House solution where the adult enters at the end & magically all problems vanish. NEWSFLASH TV EXECS: THIS DOES NOT WORK IN REAL LIFE. So when I read Real Friends, Shannon Hale’s graphic novel describing her personal experience with the complicated elementary school social scene, I. JUST. ABOUT. DIED. I love Shannon Hale normally. She’s a ya goddess. But y’all….this book is PERFECTION. I’ve never read a book that more accurately depicts tween friendship problems than Real Friends. It legit felt like Shannon read my mind and translated my memories into graphic novel form. Shannon, forever an introverted reader and writer, and her bestie Adrienne are like two peas in a pod until Adrienne joins the dreaded popular group. Shannon is granted partial admission due to association, but never quite figures out how to navigate the choppy waters. Some days she’s in, some days she’s out, and Shannon can never quite decode the seemingly unspoken social rules that other girls seem to master effortlessly. Worse still, the competition to be #1 or rather sidekick to #1, results in the kind of insidious girl-on-girl bullying that plagues our society. Real Friends never gives a pat ending. It exists in shades of grey that are more reminiscent of our life experiences. What I particularly love is that the book subtly explores personal boundaries and communicates that it’s okay and even necessary to advocate for your own. It’s a message so many girls, and even women, aren’t given. We’re supposed to be sweet and kind to all people even when grossly mistreated. LOVE. LOVE. LOVE. No lie, if I could personally hand deliver this to every tween I would. My blog post.Shannon Hale's Real Friends was a Reading Without Walls challenge for me. That is, as a child and still today, I'm not much of a group person, most likely related to my introversion. From childhood on I can recall being part of groups of people I liked, but they almost always wanted to spend way more time together than I did. Shyness is probably also a factor as we moved a lot and so I was never in a school more than three years. This made me happy to find just a single friend. Now My blog post.Shannon Hale's Real Friends was a Reading Without Walls challenge for me. That is, as a child and still today, I'm not much of a group person, most likely related to my introversion. From childhood on I can recall being part of groups of people I liked, but they almost always wanted to spend way more time together than I did. Shyness is probably also a factor as we moved a lot and so I was never in a school more than three years. This made me happy to find just a single friend. Now Shannon wanted this too, but in her case the single good friend always seems to be tied to bigger group politics which was not my experience. So I wasn't gravitating to read this one, but did because of Gene's challenge and because this is so much the reality of many children and especially my students.That is, I've been a classroom teacher for decades and have observed and helped kids navigate friendships throughout that time. Sometimes it is one person snubbing another, sometimes it a group thing (with the popping up of clubs always a sign that someone is probably being excluded), sometimes it is sweet and lovely, and sometimes it is mean and vile and intractable. And so while I didn't read Real Friends for nostalgic or personal reasons, I did read it because it was so real and raw in terms of many children's reality.Shannon's description of the ups and downs of friendship and, especially, the complicated dynamics of groups and popularity are vividly and honestly done. For kids for whom this resonates this book will be a life-saver, something that will speak to them, that they will see themselves in. Or perhaps they are yearning to be part of a group --- this may help them understand it isn't necessarily nirvana. I appreciated that Shannon isn't represented as perfect when part of a group by any means --- she doesn't do the usual forgiving of one culprit, she doesn't significantly help another bullied child (authentically being too self-absorbed in her own woes to do more than recognize her and talk to her when they are thrown together). Kudos to Shannon for being so authentic and real and honest. As an adult, I found the family dynamics most potent, especially her relationship with her big sister. Shannon doesn't hold back and, boy, is some of it rough. Fortunately, there seems to be the start of a better understanding at the end and more in the afterward that is reassuring for any who worried about Wendy.A piercingly honest view into the complicated social life of one young girl that is certain to resonate for all who have observed, participated, or otherwise experienced the difficult dynamics of school friendships. 3 Populars are not always happy STARS Primero una anécdota:Para esta navidad decidí regalar Novelas gráficas, a mi hija y mis 2 ahijadas. Este libro lo vi recomendado por todos lados. Así que lo compre para regalarlo.Pero al leerlo me di cuenta de que la protagonista y su familia son cristianos (creo), inclusive hay una escena donde aparece Jesucristo. Personalmente no me afecta. Pero si están pensando regalárselo a alguien, asegúrense de que el tópico religioso no les vaya a molestar a otros.A 3 Populars are not always happy STARS Primero una anécdota:Para esta navidad decidí regalar Novelas gráficas, a mi hija y mis 2 ahijadas. Este libro lo vi recomendado por todos lados. Así que lo compre para regalarlo.Pero al leerlo me di cuenta de que la protagonista y su familia son cristianos (creo), inclusive hay una escena donde aparece Jesucristo. Personalmente no me afecta. Pero si están pensando regalárselo a alguien, asegúrense de que el tópico religioso no les vaya a molestar a otros.Al final termine regresándolo y comprando otro.Ahora sí, hablemos de Real Friends:📚 SINOPSIS HONESTA: Este es un libro sobre una de las cosas que mas odio en este mundo, un grupito de niñas “populares”, le hacen la vida imposible al resto de niñas en la primaria.Es una historia muy entretenida, pero tiene algo que no me convenció.Es un libro que me tuvo con un sentimiento de tristeza continua, inclusive en los momentos donde la protagonista trataba de ser valiente. En especial me sentí muy mal, cuando describen a las 2 chicas mas populares, no es necesariamente que sean especiales, lo que las destaca es que son de familias adineradas, no lo dicen, pero si se puede ver entre líneas, la prota nos cuenta que siempre traen ropa nueva, que tocan varios instrumentos y saben bailar balet (lo cual solo puede ser el resultado de tomar muchas clases particulares).Las enseñanzas son muy importantes, pero agg ojalá los niños dejaran de pasar por eso. Not for me, and I would have given 1 star, but for the afterword by Shannon Hale, explaining her reasons for telling the story. Reminded me of Smile, which I also disliked for some of the same reasons. Basically, this is a book about the mean girls, where you are in the popular group and put up with the shenanigans or you're not/don't. Shannon tried to fit in, but ultimately could not abide this behavior, but then she completely ignored a girl with similar ostracism, when they met behind a bush Not for me, and I would have given 1 star, but for the afterword by Shannon Hale, explaining her reasons for telling the story. Reminded me of Smile, which I also disliked for some of the same reasons. Basically, this is a book about the mean girls, where you are in the popular group and put up with the shenanigans or you're not/don't. Shannon tried to fit in, but ultimately could not abide this behavior, but then she completely ignored a girl with similar ostracism, when they met behind a bush in the schoolyard. Run away. This graphic novel by superhero team Shannon Hale and LeUyen Pham, based on Hale's childhood school experience, made me ugly cry in the faculty room at 9:30 in the morning. Real Friends is a little TOO real, if you know what I mean, and will ring emotionally true for anyone who suffered friendship growing pains in elementary school. The subtle, uncommented-on depiction of the role of religion in Hale's young life is also completely tops. Give it to every 3rd-6th grader you know, and then to all This graphic novel by superhero team Shannon Hale and LeUyen Pham, based on Hale's childhood school experience, made me ugly cry in the faculty room at 9:30 in the morning. Real Friends is a little TOO real, if you know what I mean, and will ring emotionally true for anyone who suffered friendship growing pains in elementary school. The subtle, uncommented-on depiction of the role of religion in Hale's young life is also completely tops. Give it to every 3rd-6th grader you know, and then to all of their parents. Devastating, but in the best way possible. Ok, yeah, I liked this. But I'm a sucker for memoir GNs. Even though I side-eye Hale a little bit.I liked the direct approach (hey reader, here's a story about the friends I had growing up! ), combined with the slowly looming story of her Bear/Sister that got pretty dark.I found it accessible. But I already have a fair amount of things in common with the voice here.I did LOVE Pham's illustrations. I'm SO excited she's doing art for an upcoming Summer Reading Program.This is great for that Telgeme Ok, yeah, I liked this. But I'm a sucker for memoir GNs. Even though I side-eye Hale a little bit.I liked the direct approach (hey reader, here's a story about the friends I had growing up! ), combined with the slowly looming story of her Bear/Sister that got pretty dark.I found it accessible. But I already have a fair amount of things in common with the voice here.I did LOVE Pham's illustrations. I'm SO excited she's doing art for an upcoming Summer Reading Program.This is great for that Telgemeier/Gownley/Jamieson/Holm set.Yep, great. Ate it up. I wish I had had this book in 4th-6th grade. It would have been good to know I wasn't the only one who felt awkward. One of the scary things about becoming the mother of a little girl is knowing/fearing that she is likely going to experience some mean friends in her future. I think all of us have. Even the girl who I consider my best childhood friend to this day was incredibly cruel to me at times. I know I was cruel to others, and am ashamed of it. As Shannon says, when we are young our worlds are small, and it's so hard to see outside of your surroundings. If you feel like you don't fit in or haven't found ' One of the scary things about becoming the mother of a little girl is knowing/fearing that she is likely going to experience some mean friends in her future. I think all of us have. Even the girl who I consider my best childhood friend to this day was incredibly cruel to me at times. I know I was cruel to others, and am ashamed of it. As Shannon says, when we are young our worlds are small, and it's so hard to see outside of your surroundings. If you feel like you don't fit in or haven't found 'your people', every day can be pure torture. But that's why I love love love Shannon Hale for putting out this graphic memoir. She says she didn't have a remarkable childhood, and this isn't a remarkable story. That's why it's so powerful--it's a story so many young girls can relate to in its (unfortunate) normalcy. I'll make sure my girl reads it in 3rd or 4th grade, and I hope it makes her realize if she's having a rough time she is not alone and that it is not forever. I hope it's one of the things that helps her choose kindness and to surround herself with people who make her happy and feel good rather than yucky inside. This graphic novel SPEAKS to me. I think most people grow up with the struggles of making not just friends, but real friends who will stick with you no matter what. Shannon Hale digs deep into her own experiences of making friends from elementary school to middle school, all the nitty gritty and painful trauma of bullies and peer pressure to join a “popular” friend group. She’s honest and introspective about her past actions and worries, her retrospective commentary is perceptive but she keeps i This graphic novel SPEAKS to me. I think most people grow up with the struggles of making not just friends, but real friends who will stick with you no matter what. Shannon Hale digs deep into her own experiences of making friends from elementary school to middle school, all the nitty gritty and painful trauma of bullies and peer pressure to join a “popular” friend group. She’s honest and introspective about her past actions and worries, her retrospective commentary is perceptive but she keeps it in the background, she doesn’t belittle the children’s anxieties about making friends as childish looking back as an adult now. There’s so much heart in this story. It’s so full of simple but profound and indescribable emotions, like the hurt of being left out or ganged up against, and the relief and excitement of connecting with someone that can grow into friendship. The graphic novel format is perfect to convey these feelings. There are moments that make me cry and then some that make me laugh. Most of all it gave me a lot of hope in myself. I especially love the relationship between Shannon and her sister Wendy, I really wanna know more about Wendy and how their relationship grew after the years in this book. The author’s note is also a bonus that packs the final punch to all the emotions I felt reading the book. The art by LeUyen (pronounced Le-Win) Pham is also beautiful. It captures the humour and imaginative turns in the story so vividly, keeping great pace with the narration over 5 years. What I love most is that the art really enhances the complex emotions of the story, even when it’s just visuals/images and no words going on. I can feel what Shannon is feeling even without commentary (in a perfect show, don’t tell way), and see what the adult Shannon now reflects on that little Shannon then did not notice. This book is going to have a very personal place in my heart. I highly recommend it to everyone! Fantastic graphic novel from prolific children's author Shannon Hale. This engaging and emotional graphic novel explores the tricky and sometimes painful experiences in school and with making friends. Topics include bullying, anxiety, being true to yourself, friendships etc. Nothing is heavy handed and this title will fly off the shelves at my library. Fantastic illustrations are done by LeUyen Pham who can draw the realistic girls as well as their imaginative play perfectly. Okay so I actually finished this book a while ago however for some reason I've been really bad about marking my books as read in Goodreads. Anyway with that being said I must say that I enjoyed this graphic novel not only because of the artwork but also the message behind the story. It isn't easy being a kid and I think a lot of times adults make that assumption and mistake. It can be heard to make friends and even more difficult to try to fit in. This book definitely touches on the process of m Okay so I actually finished this book a while ago however for some reason I've been really bad about marking my books as read in Goodreads. Anyway with that being said I must say that I enjoyed this graphic novel not only because of the artwork but also the message behind the story. It isn't easy being a kid and I think a lot of times adults make that assumption and mistake. It can be heard to make friends and even more difficult to try to fit in. This book definitely touches on the process of making friends, bullying, and even mental health as if applied to the life of Shannon Hale. I had no idea that this graphic novel was going to be biographical but I'm glad that it was because it added more substance to the work. I really enjoyed it and would definitely recommend it to parents who have reluctant readers or to parents who are looking for books related to the process of making friends and fitting in. I wish that there were more children's graphic novels when I grew up. I definitely could have used something like this. I received an ARC from NetGalley in exchange for an honest review. Thanks, NetGalley!This is the story of a young Shannon, who recounts the series of friendships she had growing up and the impacts each made. I was surprised to open up Real Friends and discover it's actually a graphic memoir. As Shannon recounts her early school years through a series of friends she had, I was thrown back in time to the mid-late 80s when I was going through the same things Shannon did in the late 70s/early 80s. S I received an ARC from NetGalley in exchange for an honest review. Thanks, NetGalley!This is the story of a young Shannon, who recounts the series of friendships she had growing up and the impacts each made. I was surprised to open up Real Friends and discover it's actually a graphic memoir. As Shannon recounts her early school years through a series of friends she had, I was thrown back in time to the mid-late 80s when I was going through the same things Shannon did in the late 70s/early 80s. Some things are just universal. While this book is aimed at middle-grade readers I think anyone can find relatable moments.I found myself in different friend roles growing up. Sometimes I was an Adrienne. My family would move, or I would change schools, and I would lose touch with my friends and have to start over again. Sometimes I was a Jen, although I never made people line up and be ranked in the order of who I liked the best (what a cruel thing to do!). Once or twice I'm sure I was a Wendy. I was the only girl in my family and sometimes I just couldn't take the nonsense and would totally snap bear-out at my brothers. Then there was exactly one time I was a Jenny. To this day I regret acting the way I did, but nothing can change what's in the past. We can only move forward and learn to choose kind.But for the majority of my childhood I was a Shannon: shy, quiet, not sure how to make friends but knowing that I really, truly wanted someone to talk to and experience life with. I also made up games and was sometimes bossy or just oblivious when others were bored or left out completely when I became self-absorbed in the creative process. You're gonna get the feels and if you're lucky enough to still have a bestie from childhood you're gonna want to call your best friend as soon as you've finished reading. Two of my favorite kidlit superstars team up for this heartfelt graphic novel that's perfect for fans of Smile or Sunny Side Up. Shannon Hale's memoir of struggling to make and keep Real Friends during her elementary school years is accessible and poignant. This is a book that will strike a chord with many young readers. LeUyen Pham's expressive artwork is a perfect match for the story and text. I have long been a fan of her work and I'm thrilled to see more longform art from her. In the acknowl Two of my favorite kidlit superstars team up for this heartfelt graphic novel that's perfect for fans of Smile or Sunny Side Up. Shannon Hale's memoir of struggling to make and keep Real Friends during her elementary school years is accessible and poignant. This is a book that will strike a chord with many young readers. LeUyen Pham's expressive artwork is a perfect match for the story and text. I have long been a fan of her work and I'm thrilled to see more longform art from her. In the acknowledgements, Pham says that Hale's story could very well be her own (another testament to how universal and needed this story is) and it shows in the care she takes with the artwork. This is a must-purchase for library and classroom collections! Great story and great illustrations! If you like Raina Telgemeier you'll like this! Graphic novel and memoir and childhood memories. What's not to love about that?